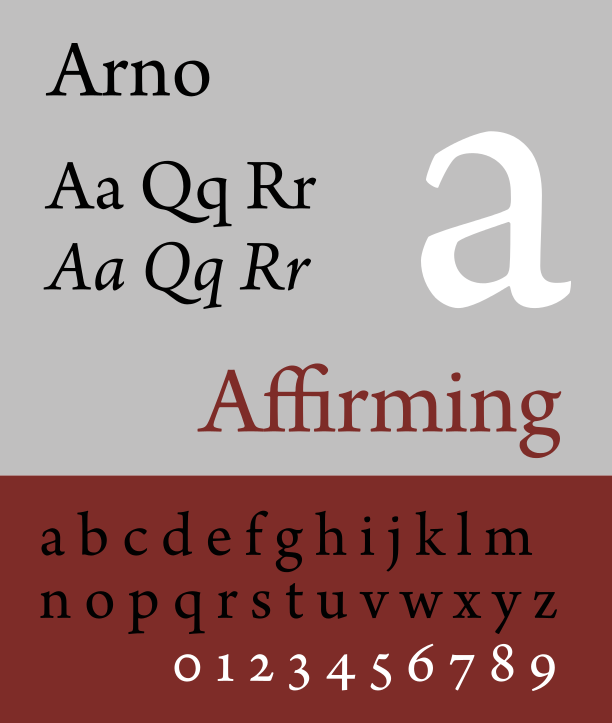 Arno is a serif type family created by Robert Slimbach at Adobe intended for professional use. The name refers to the river that runs through Florence, a centre of the Italian Renaissance. Arno is an old-style serif font, drawing inspiration from a variety of 15th and 16th-century typefaces. Slimbach has described the design as a combination of the period’s Aldine and Venetian styles, with italics inspired by the calligraphy and printing of Ludovico degli Arrighi. Arno was released in five optical sizes: separate fonts for different text sizes from captions to headings. In addition, Arno contains alternate letter styles such as swash italics inspired by Renaissance calligraphy. Other supported OpenType features include proportional and tabular numbers, old style figures, subscripts and superscripts, and ordinals. It was a winning entry in the Type Directors Club 2007 Type Design Competition (TDC2), under the Type System / Superfamily category. Document design expert Matthew Butterick used Arno in the print edition of his book Typography for Lawyers.